Rabbi Yakov Horowitz, founder of Monsey-based Darchei Noam Yeshiva, visits Israel to promote awareness of child abuse. At first glance, Rabbi Yakov Horowitz hardly seems to fit the bill for a social activist. A mild-mannered 57-year-old father of five and a member of the Hasidic community in Monsey, New York, Rabbi Horowitz has over the past two decades become perhaps the best-known figure in the Orthodox community working to combat child abuse. A graduate of the Mesivta Torah Vodaas Yeshiva, Rabbi Horowitz spent 15 years as an 8th grade teacher at a haredi school in Boro Park, Brooklyn. During his years as a teacher, Rabbi Horowitz was shocked to discover that a number of students had been the victims of physical or sexual abuse – resulting self-destructive behavior, including drug abuse. Drawing from his experiences with these students, Horowitz penned an article for the May 1996 issue of The Jewish Observer, entitled “An Ounce of Prevention”. The article, which sought to raise awareness of the problem of child abuse and help prevent future cases, sparked a firestorm with the haredi community, where discussion of such issues was still strictly taboo. Working with Agudath Israel of America, Rabbi Horowitz later founded Project YES (Youth Enrichment Services) to provide counselling, guidance, and support for at-risk teenagers in the Orthodox community. Project YES also works to educate parents about child abuse and how to protect their children. In 1997, Rabbi Horowitz founded the Darchei Noam Yeshiva in Monsey. Unlike many other schools in the haredi community, Darchei Noam emphasizes both religious and secular studies. 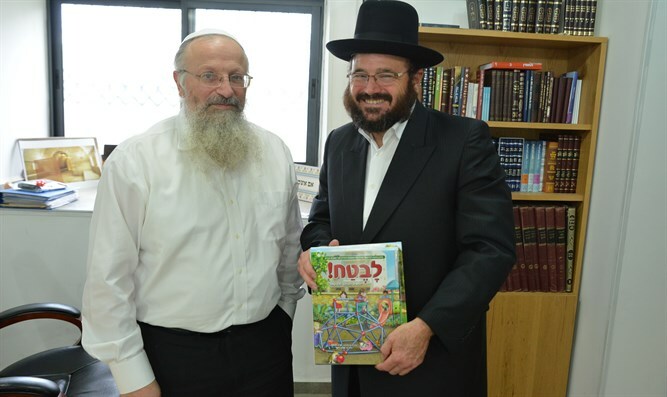 Last week, Rabbi Horowitz visited Israel, in part to promote the Hebrew translation of a children’s book aimed at teaching kids how to stay safe. Originally published in English nearly a decade ago as Let’s Stay Safe!, Rabbi Horowitz hopes the Hebrew version, Lvetach (Be Safe), will help not only Israel’s haredi community, Religious Zionist families as well. During his trip to Israel, Rabbi Horowitz met with a number of rabbis from the Religious Zionist community, who praised his efforts to raise awareness on the issue of child abuse. Among the rabbis he met during the trip were Rabbi David Stav, chairman of the modern Orthodox Tzohar organization, and Tzfat Chief Rabbi Shmuel Eliyahu. Rabbi Eliyahu, who heads a committee responsible for investigating claims of sexual misconduct in the Religious Zionist community, also praised Rabbi Horowitz’s work.